2. Make an indentation in center of each patty; place an egg yolk in each. Arrange 2 anchovy fillets around each egg yolk. 3. Press sour cream through pastry bag with number-5 fluted tip to form circle around edge of each patty. Refrigerate, lightly covered, until serving time. 4. In small bowl, combine catsup, chili sauce, and brandy; mix well. 5. Sprinkle with capers and onion. Garnish with lemon quarters. 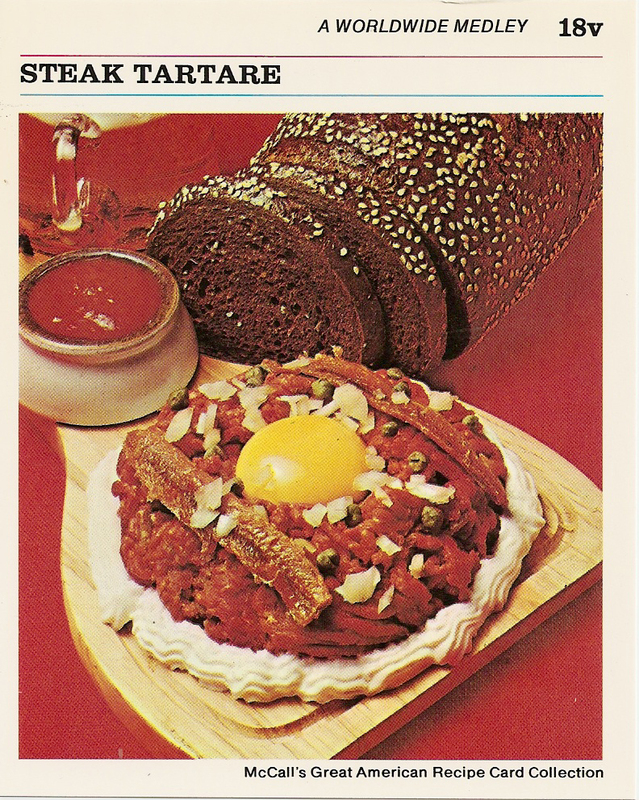 Serve with bread or toast. Makes 4 to 8 servings. These days, this meal would trigger major class action law suits. People had real hardy stomachs. My father used to enjoy having steak tartare but it never had all that sauce in it. Just mean and onion and an egg yolk. In fact he used to eat raw beef and onion sandwiches. He called them cannibal sandwiches. My dad isn’t dead, he just doesn’t eat that anymore. IDK why. If anything meat is probably cleaner than ever.